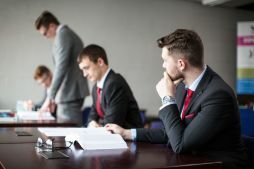 Mooting competitions provide essential experience and knowledge of a working courtroom, so why not enhance your knowledge and skills by taking part. 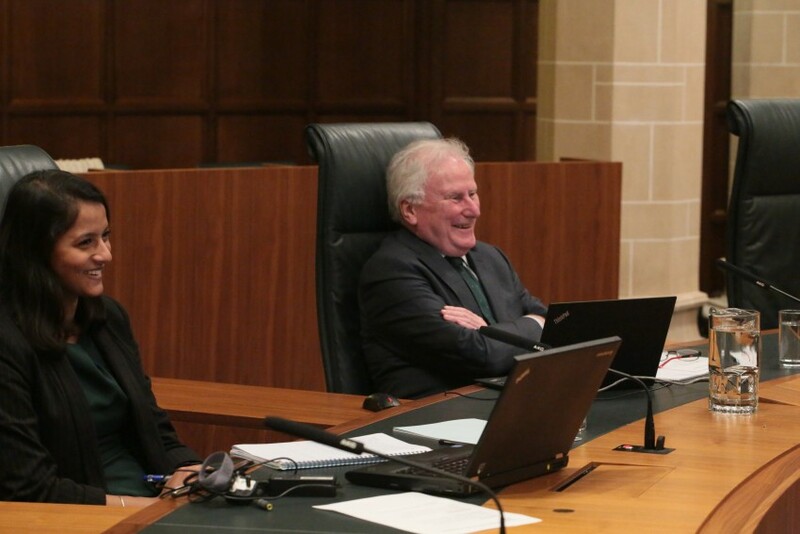 Ulster University law students present to five UK Supreme Court justices. A moot is an argument on points of law which aims to simulate, as far as possible, an authentic court hearing before a judge. You will play the role of counsel and present your arguments in front of a judge whilst competing against another team. A successful mooter in one who manages to persuade the judge of the superiority of his or her legal arguments. 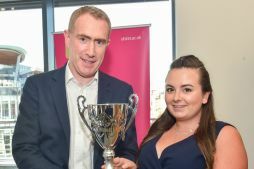 Ciaran McAlinney, from A & L Goodbody, Belfast (sponsors of the competition) presents the trophy to 2018 winner, Eimear Fanthorpe, at the Law School's Annual Prize Giving Event held on Graduation Day 2018. You will have to analyse a problem, research the law surrounding it, prepare written submissions and present an oral argument. Most problems surround an area of law that is unsettled or subject to recent developments. Law students are encouraged to participate in internal and external mooting competitions. Staff will help and guide you through the information and preparation. Mooting is also incorporated in several modules throughout the undergraduate degree. These are intense and demanding events but highly rewarding, giving students a real insight into styles of legal argument that help them to appreciate the role of law in society, including its limitations and deficiencies. We currently have a mock courtroom in room 12L04 of our Jordanstown campus. Ulster Law students in action in our Moot Court Room. However plans are underway to create a state-of-the-art mock courtroom at the Belfast City campus, which will be available for students to use from 2020. 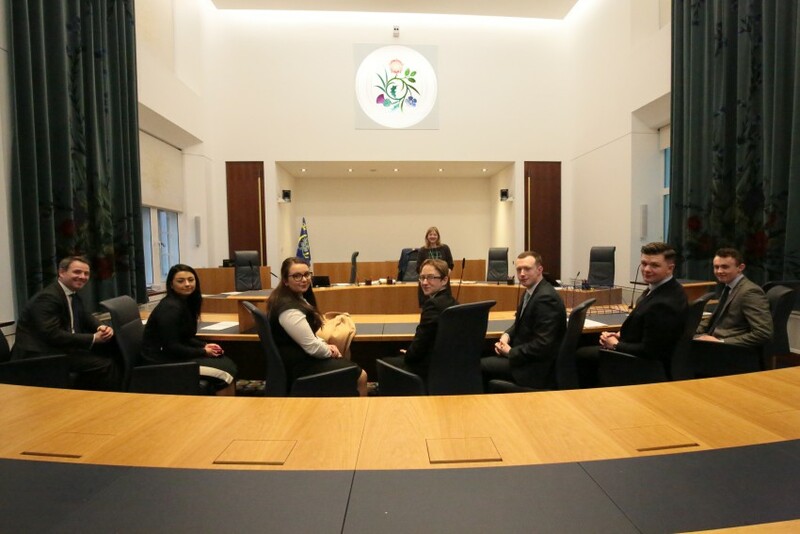 The National Moot Court, hosted by Dublin City University, at Criminal Courts of Justice, Dublin. Aoife King Memorial Moot Court Competition, Dublin City University, Dublin. 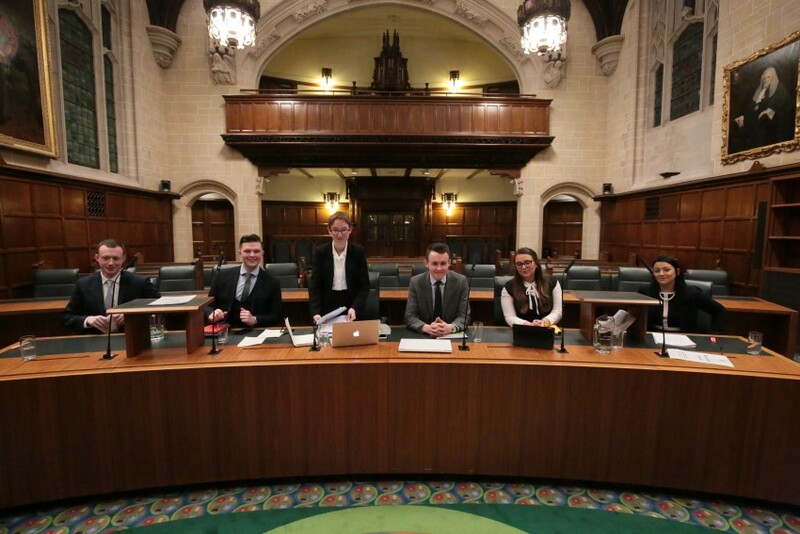 In February 2018, Ulster University mooted for the first time in the Supreme Court in Parliament Square, before Lord Kerr of Tonaghmore. 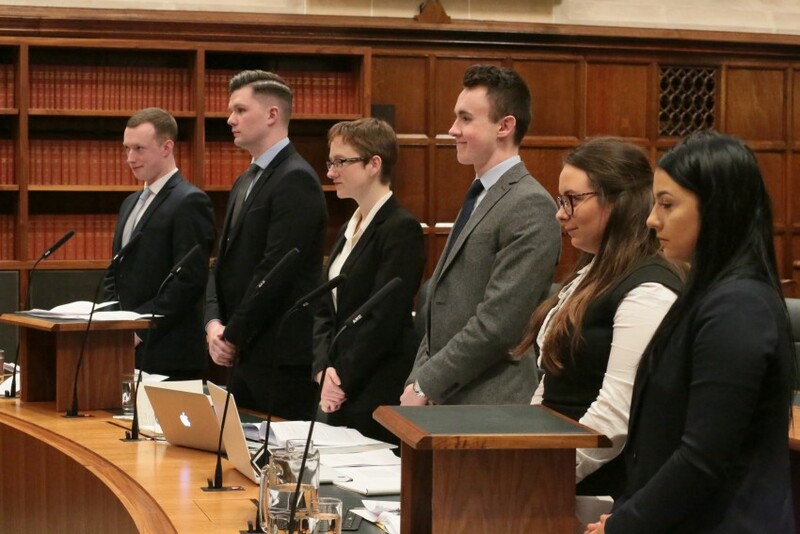 Jordan Thorburn, Andrew McFadden, and Danielle Gallagher acted for the Appellants, while Eimear Fanthorpe, Belinda Widocka and Ben Lowry appeared for the Respondents, with the Appellants' team being judged the winners by Lord Kerr and his Judicial Assistant. 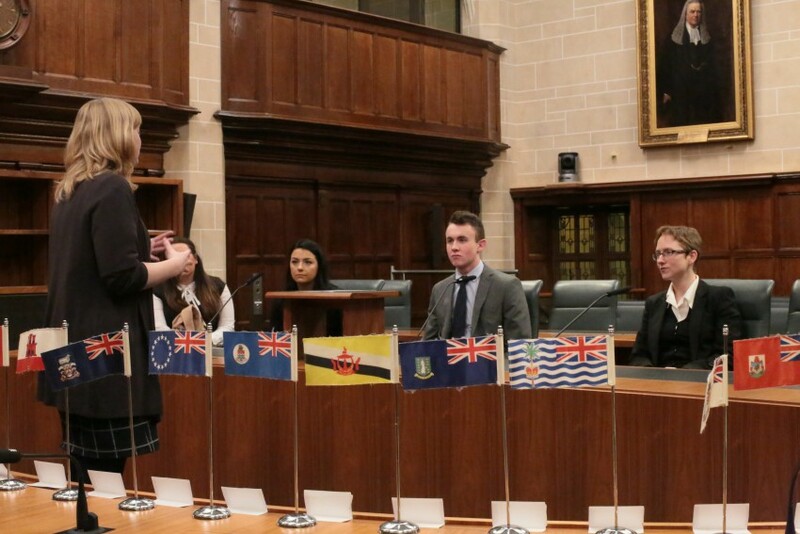 The students were given a tour of the Supreme Court building, which also houses the Judicial Committee of the Privy Council, as part of the experience. ‘Mooting has been a great experience in terms of learning how to apply the research skills we develop in academia to a more practical outcome. There is nothing quite like the feeling of developing an argument based on close reading of case law, and seeing a Judge (especially a Supreme Court Justice!) be persuaded by a combination of the principles you have identified and the advocacy of the Counsel. ‘ The best way to describe mooting is it is like taking on a mini-module except the craic’s 90. Rather than learning a broad topic, mooting necessitates you to independently learn a niche area of law which has greatly improved my researching ability and made me more adaptable to reading case law which is fantastic as it has helped my learning in other modules. Mooting has taught me the skill of courtroom advocacy and also improved my overall confidence which will stand to me in my future career endeavours. I have used the presentational skills I learned in mooting to successfully gain a place in an American University next year- something which I would never have had the confidence to apply for before I began mooting. Ciaran is a Senior Lecturer at Ulster University’s School of Law. 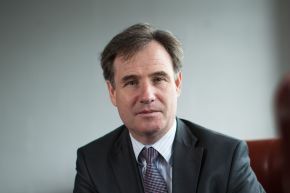 His teaching, research and legal practice interests include employment law (particularly equality law), public law (especially devolution and the constitutional arrangements), and Human Rights law.